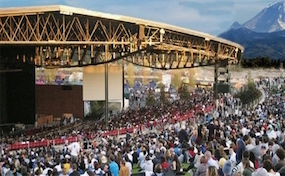 The White River Amphitheatre is the premier summer venue in the Seattle-Tacoma metro area. The White River Amphitheatre box office is located at 40601 Auburn Enumclaw Road. The facility opened in 2003 and has 9,000 covered seats and a capacity 20,000 overall. Notable events at White River Amphitheatre include an opening concert of Berlin with Heart and a live CD recorded by Jimmy Buffett in the venue\?s first year. The facility is currently managed by Live Nation and is frequented by most of the biggest traveling artists during their summer concert series. WhiteRiver.AmphitheatreAuburn.com is a privately owned and operated company that operates exclusively in the online resale secondary marketplace. We are not associated with any primary box office, venue, and or official website. Prices on our sites tend to be above face value and will change quickly with market conditions. To purchase tickets for all White River Amphitheatre Auburn events please follow the process online through the checkout or call our friendly operators at your earliest convenience.